Officials perform a vital role in the game at all levels are the third team on the ice, without whom the game would not happen. The Hockey Canada Officiating Program is for anyone interested in officiating the game of hockey, from beginners to seasoned veterans. There are six levels in the Officiating program, from those looking to get started to the top tier of officials. The lower levels are designed to get you started in officiating, while the higher levels are open to officials who have advanced through the lower levels and show potential to work the top levels of hockey in Canada, and Internationally. For new Officials or those interested in getting started, you will need to attend an HCOP Entry Level certification clinic but before you do, contact your local Minor Hockey Association to find out of their demand for new officials, when games will take place and how this fits your schedule. A participant must be a minimum of 14 years of age to enter the program. Please check back in September for Entry Level Clinic Information. This 3 hour clinic provides instruction to individuals filling the important role of the Off-Ice Official in the Timekeeper box in local Arenas throughout the OMHA. Curriculum includes Hockey Canada and OMHA Rules, Regulations, Policies, and Procedures. Roles and Responsibilities of the Off-Ice Official, including pre-game and post-game will also be covered in the Clinic. For further information, including hosting an Off-Ice Officials Clinic, contact the OMHA Office. The 2018-19 OMHA Recertification email notification has been sent. This year all registration will be completed online as in the past. ALL officials Level 1 - 6 will be required to complete Online Modules, which include the National Exam. Eligibility for the 2018-2019 season requires the completion of your Online Modules/Exam before September 30, 2018 and is required prior to your attendance at a mandatory In-Person Clinic. Registration deadline for all In-person clinics is seven (7) days prior to clinic date, space permitting. Completion of the registration process is required before an Official can accept any assignments for the current playing season. Failure to execute these steps will violate OMHA Regulation 18.1(a). This will mean that the Official will be considered to be “not in good standing”, and may be subject to further discipline. Changes to clinics must be received in writing at least five (5) business days prior to the clinic date. A Fee of $26.00 ($23.01 + $2.99 HST) applies. Changes accepted only if space is available at the Clinic. The Respect in Sport training for Activity Leaders is a requirement in the OMHA for officials that have not already completed the training. Any official who has not taken this training MUST complete the Respect in Sport for Activity Leaders prior to attending a Clinic. All refund requests to the OMHA must be received before November 1st of the current season. No refund requests will be processed prior to November 15th. All refunds will be pro-rated and subject to an administrative fee. Please check your E-Hockey account and verify that your Criminal Record Check/Vulnerable Sector Check qualification is up to date and not expiring May 1, 2018. Failure to have an updated CRC/VSC will prevent you from registering to re-certify for the 2018-2019 season. In your HCR profile, you will find status, including expiry date in the ‘CRC’ tab. If your expiration date is prior to the 2018-19 season, you must obtain and submit a new Criminal Record Check or Vulnerable Sector Screening Check to the OHF before you will be allowed access to the program. • On-Ice Officials aged 17 and under must provide a Criminal Record Check. • On-Ice Officials aged 18 years and over must provide a Vulnerable Sector Screening Check. • When requesting the VSC, you may be required to provide a letter to your local police service. Receipts are acceptable as suitable for submission if you have initiated the process of obtaining the CRC/VSC. • If your HCR profile indicates your CRC expiry beyond the 2018-19 season, you must complete in full, sign and submit the Criminal Offence Declaration to the OHF Office. If submitting via fax or scan (PDF) and it is not deemed a true copy, submission of the original by mail will be requested (no pictures will be accepted). Please contact the OMHA or OHF office if you have any questions on this process. The 2018-19 On-line Cross-over Registration to the OMHA is now available. The cut off date to have all Cross-over registrations to the OMHA is October 31st. You will not be able to register online if your CRC/VSC and Speak Out Certification or on-line equivalent Respect in Sport/Activity Leader Program is not up to date or completed. 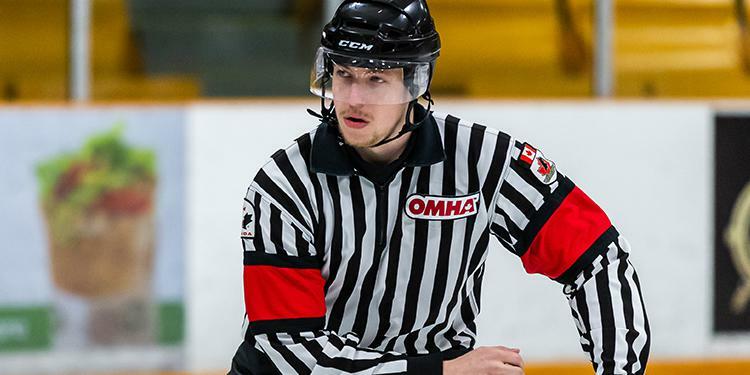 The OMHA Cross-over Fee is $55.00 for all Game Officials. Cross-Over Registration with the OMHA must include On-line Registration and Payment. Please Note that Registration and Payment does Not suggest completed OMHA Cross-over status until your 2018-19 HCOP Recertification requirements can be confirmed. Registrations must be submitted to the OMHA on-line and confirmed in order to be eligible to skate the 2018-19 season. Cross-Overs must be completed online. They will Not be accepted by mail or fax. If you have been registered in hockey previously as a Player, Coach, Official, or Trainer you can access your profile on the Hockey Canada Registry by establishing an eHockey account. Click on the following document to set up access. When fun gets lost in 'winning at all costs'. ©2019 Ontario Minor Hockey Association / SportsEngine. All Rights Reserved.